Released in 1980, Ideal’s Beware the Spider is a test of nerves, skill, and possibly even arachnophobia. Taking a page from Operation’s playbook, Beware the Spider uses two C-batteries to power a silver, conductive web on which various multi-coloured plastic spiders are placed. 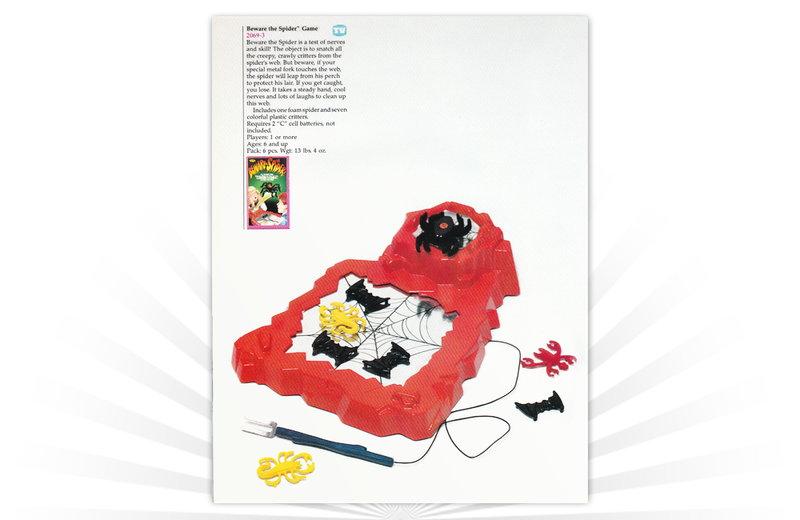 A larger felt spider is situated next to the web and overlooks the gameboard. Players take turns attempting to remove a spider from the web using a special metal fork that is connected to the board via a wire. Touching the surface of the web with the fork completes the electrical circuit causing the larger spider to leap out to protect its layer. Any player disturbing the spider loses their turn. The player collecting the most spiders from the web is declared the winner. "You're up and headin' for home. Carrier rendezvous accomplished!"